Basketball 3-on-3, one of the fastest growing urban sports in the world, will be included in the 2020 Tokyo Olympics. And from July 13 to 14, the inaugural Iskandar Investment 3-on-3 Basketball Challenge will be held at the EduCity Sports Complex, Iskandar Puteri, Johor, to discover Johor’s top talents in basketball. Hosted and sponsored by Iskandar Investment Berhad (IIB), this national level competition, is jointly organized with the Johor State Basketball Association (JSBA). Details of this prestigious sports event was announced by IIB Senior Vice President, Azhar Jamal, EduCity Chief Operating Officer, Sugumaran Kailasan and JSBA President, Datuk Daniel Lee Cheng Chuan, at a media conference recently. This Challenge offers 14 championship titles for athletes, both men and women, in the various age group categories from 12, 14, 16, 18 to 21 as well as the Open and Boarding Schools categories. The top three winners in each category will take home cash prizes, medals and other goodies in one of the most lucrative challenges in the southern region, with total prize money in the sum of RM16,000. Title sponsor, IIB is proud to collaborate with JSBA to promote Basketball 3-on-3 in Johor. “This is in line with our mission to instill a sporting culture and a healthier lifestyle among Iskandar Puteri residents and promote this new city as a sports destination,” said IIB President/Chief Executive Officer, Datuk Ir. Khairil Anwar Ahmad. “Johor has one of the best sports infrastructure in the country after Kuala Lumpur and is blessed with many sporting talents in various fields,” he added. “With sports as a medium for education, our vision is to develop Iskandar Puteri as the preferred sports center in this region,” said IIB Senior Vice President, Azhar Jamal. Meanwhile, EduCity Chief Operating Officer, Sugumaran Kailasan, reiterated that the EduCity Sports Complex that was opened in 2013, is a comprehensive world-class sporting venue which is ready to host international events in Iskandar Puteri. Designed with multiple Olympic-standard courts, tracks and swimming pools, the Sports Complex has hosted various international events including the EduCity Sundown Marathon, the EduCity Duathlon Challenge, the NAZA National Rugby Sevens Series, the Iskandar Puteri Sevens, Iskarnival AKTIF and rock concerts, among other events. JSBA President, Datuk Lee, said that the Challenge will serve as an ideal platform to unearth quality Johor talents and present a good training ground for the professional players in the run-up to the Malaysia Games or SUKMA XIX in Perak, this September. “This is a critical milestone in the wider development of basketball in Johor,” said Datuk Lee as he expressed his appreciation to IIB for their support in hosting and sponsoring the Challenge event. Basketball enthusiasts can also look forward to two side events planned prior to the Challenge. They are a Referees’ Clinic on July 7 and a Basketball Clinic on July 13, for players aged 16 and below, both to be held at EduCity. The Challenge event is co-sponsored by Gatorade, makers of isotonic drinks, Molten, the world’s most famous basketball brand and Pusat Pakaian Hari Hari, an apparel chain with 85 stores nationwide that will sponsor items like uniforms and jerseys. To date, teams from almost all the districts in Johor have confirmed their participation. The Challenge is also open to non-Malaysians. To register, send applications to Spotify at https://www.spotifyapp.com/jsba-3x3-basketball-challenge-2018/ or call JBE Hoops Station Skudai Parade on Tel: +607 – 5565370. Entries may be submitted from now till July 7, 2018. But what does ‘S4CF’ mean? It stands for ‘Strive 4 Cancer Fighters’ a programme organised to encourage cancer fighters cared for under the Tunku Laksamana Johor Cancer Foundation. In a breaking-of-fast event hosted at the Amari Johor Baru recently, some 30 children diagnosed with cancer and supported by the Foundation, were escorted by their parents and guardians to the Amaya Food Gallery. It was a bitter-sweet gathering where families with young children, many of them wearing facial masks to protect against other infections, enjoyed a special time of bonding with a sumptuous spread from the buffet prepared in the theme, WarisanTradisi Asia. The event was arranged on a Public Holiday so that the patients and families could join the event, some who even came all the way from other districts including Muar, Batu Pahat and Pontian. At the Maghrib call for prayers which marked the breaking-of-fast, the guests enjoyed tasty treats from a choice of over 100 dishes prepared in traditional Malay, Chinese, Indian, Thai and European recipes. Throughout their meal, they were entertained by a live Ghazal music performance. Representatives from the Foundation at the event included, Executive Director, Datuk Mohamad Perang, Chief Executive Officer, Mohd Anizam Mohd Jamian and Technical Committee Secretary, Rosli Ithnin, and Permodalan Darul Takzim, Chief Executive Officer, Tuan Haji Lokman. They were greeted by ONYX Hospitality Group’s Area General Manager, Dean Rossilli, who joined them for the meal and later, to present gifts to the guests. During the gift presentation, the guests were thrilled to receive goodie bags filled with food items sponsored by Maslee Sdn Bhd, a premium item and balloons from Angry Birds Activity Park as well as duit raya in packets, presented by the hotel. The arrival of Red, the mascot from Angry Birds Activity Park Johor Baru, caused a stir of excitement when it joined the young guests at the Amaya Food Gallery. In fact, many of them could not resist capturing a photo memento with this bright feathered friend! “We support and value the communities in which we live and work by bringing our social responsibility commitment to live and organizing several activities for the less fortunate,” said Rossilli. “As the holy month of Ramadan is the time for bonding, caring and sharing, it is our obligation to help those in need,” he added. Since the start of this year, the hotel has organised several Corporate Social Responsibility activities with the aim to support and provide educational opportunities for underprivileged children in poor areas in Johor. “By August this year, the hotel would have put an educational programme in place to inspire young children to join the hotel industry,” announced Rossilli. As a token of appreciation to Amari JB for hosting the event, a plaque signed by Her Majesty, the Permaisuri of Johor, was presented to the hotel and received by Rossilli. Also present at the event were nurses from the Oncology Department of Hospital Sultan Ismail, the Foundation committee members, the Amari JB Corporate Social Responsibility Committee members and the hotel’s Director of Public Relations and Marketing Communications, M.S. Bobby. Contributions are welcome in one-time donations or monthly donations. It’s Sunday morning and I’m at Marlborough College Malaysia to speak to some 100 fulltime boarders to share my stories on Johor and talk about a career in writing. While I considered the invitation, I learnt that on Sunday mornings, the college would arrange for guest speakers or chapel services for their boarders. I’m told that the talks by Sunday Speakers should broaden the students’ perspectives while promoting soft skills within the college. And by exposing the students to different experiences, it may also help them with their studies. The college clearly aims to coach their students, not only in obtaining multiple A’s or high scores in academic subjects, but also to develop their minds and character. I like how the college offers an outward looking education that encourages critical thinking to produce well-rounded achievers! So here I am to share my story to inspire the youngsters, encourage them to consider a career in writing and to open their eyes to life beyond college and university. Deputy Head – Pastoral, Nick Eatough, welcomes me on arrival and leads me to the hall where the talk will be held. Designed as a theatre, the hall has a stage with two wall projection screens – one on each side of the stage – while its front walls are adorned with panels of dramatic, dark curtains. I’m glad the microphone and lectern are arranged down-stage (not on the stage!) as I prefer to stand closer to the audience. In fact, I prefer not to have the lectern at all and it is removed upon my request. Two female students are assigned with the tasks, one to introduce me and the other to close the event – and I must say that they both did an excellent job! By about 10.30am, the seats in the hall slowly fill up with youths aged between 10 and 17, made up of various nationalities including British, Asian, European and Australian. It’s interesting that in this talk, I will be introducing myself as a writer of many published newspaper articles besides being an author of a bestselling non-fiction book. I’m no stranger to this college as my previous visits here were to write about the college’s catering services, their sports event dubbed, Marlborough Miles, and a fund-raiser through an art auction. I start by introducing my book, My Johor Stories: True Tales, Real People, Rich Heritage and talk about its journey to success after its launch last year. Using appropriate photographs, I give the audience a glimpse of the nature of my work. I talk about my writing assignments and discuss some of my on-the-job experiences, from interviews with various personalities to hotel and food reviews as well as travel to destinations both local and abroad. I explain that my collection of published stories as well as exclusive posts are stored in my blog, My Johor Stories at www.peggyloh.com and how this ultimately led to the publication of My Johor Stories, the book. Then I take them on a flashback to where it all started: My inspiration and motivation as I introduce myself and our family in Johor Baru. I talk about my hobby in Reading and Writing, and how advantageous this is for my work. I also share a brief outline of The Writer’s Etiquette, based on my own practices with basic do’s and don’ts that go a long way to build a strong reputation as a credible and sought-after writer. From a choice of photographs published in my book, I share some story highlights mainly on Johor culture and heritage. One of them is my story on Johor Baru’s Historic Hills and Palaces. Among other things, I pointed out that the Elizabethan architecture for the majestic Dato Jaafar Building on Bukit Senyum was modelled after Hardwick Hall in England. Later (over a cup of tea! ), I learn that this struck a familiar chord with the English master, a gentleman who used to live close to Hardwick Hall in Derbyshire! Thank you, Nick Eatough and Marlborough College Malaysia, for the privilege to be counted among your Sunday Speakers. Eighty children from two charity homes were treated to a breaking-of-fast meal at the Olla Restaurant in Granada Hotel, and were pleasantly surprised to meet with Marvel’s Ironman and Spiderman as well as Star Wars’ character, Darth Vader! Guess who else were at the Ramadan event at Hotel Granada? After the children – boys and girls aged between five to 16 years – from charity homes, Pertubuhan Sosial dan Kebajikan Sari Saujana and Raudhatul Maryam, had said their Maghrib prayers (that marked the breaking-of-fast), they happily helped themselves to colourful cakes and desserts, as well as refreshing ice-lollies. Just as they were settling down to start their main meal, the atmosphere was suddenly charged with excitement when the Master of Ceremony announced that they would be joined by special guests. The boys surged forward to mob the costumed characters! At the appearance of the costumed characters, the children could no longer keep to their seats but surged forward to mob them and touch their costumes, maybe to find out it was for real! This annual charity event was part of the hotel’s Corporate Social Responsibility Programme in caring for the less fortunate and giving back to the community. helping the young guests to desserts from the buffet. Most of the young guests were at the hotel for the very first time and with the help of the staff and hotel general manager, Alan Tan, they served the guests from the sumptuous spread designed in the theme, Citarasa Malam Samudera Buffet. “We believe that in this holy month, extending our helping hand would make someone’s day and today, it belongs to these children,” said Tan. “Hosting the Ramadan buffet is just one of the ways of sharing this wonderful festive season with them and contributing packages of daily necessities will help them in preparing for the coming celebrations,” he added. In addition, the hotel also contributed duit raya in green packets that were presented to each child by Group Chief Operating Officer, Jeslin Chong. The chef was helping the young ladies to their meal at Olla. This event was successfully accomplished with the partnership of co-sponsors, Handal Indah Causeway Link which provided chartered buses to ferry the children to and from the event and Tiong Nam Logistics Holdings Bhd which sponsored gift packages that included bags of rice and daily necessities, to both the charity homes. The appearance of the costumed characters was generously arranged by Apizzero Cosplay. Once the children were familiar with the layout of the buffet spread, they enjoyed a leisurely meal and happily helped themselves to more of their favourite items. Officer, Jeslin Chong, presents the children with duit raya. With stomachs satisfied, the young guests and their carers went to perform their Terawih prayers in an allocated room, before leaving the hotel with pleasant memories of their special Ramadan treat at Hotel Granada. The Citarasa Malam Samudera Buffet at Olla Restaurant is being served from now till June 12, priced at RM99 nett per adult and RM59 nett per child aged from four to 11 years. Olla Restaurant is at the lobby level of Hotel Granada Johor Baru, located at 55, Jalan Indah 15/2, Bukit Indah, 81200 Johor Baru, Johor. For enquiries and reservations, Tel: +607 – 231 8805 or +6016 – 772 7352. For more info, visit website: www.careluxuryhotels.com/hotel-granada. Lamb Shank tinged with Briyani flavours, Char Siew Salmon – salmon steak with a hint of char-siew taste and Beef Stroganoff with a refreshing side of salsa – these are just a few of the creative Western-Asian fusion ideas applied in the Dine Restaurant menu. Executive Head Chef Kalidass said, “Burnt Fork,” in an attempt to translate the Chinese word for barbecued pork, char-siew, into English. We share a laugh over this as we both agree that the barbecued meat flavour on a salmon steak is really quite an unusual but agreeable combination of tastes. Several years ago I met Chef Kalidass or Chef Dass, in short, while he was with another restaurant. Meeting him again at Dine Restaurant is like getting to know him all over again as I witness and experience the way his culinary skills have developed. While he shares with me, his humble beginnings and his journey to where he is now, I see a model of local youth who has worked hard and achieved his career goals. Guided by strong mentors and trained in international brand hotels in Germany and Singapore, Chef Dass is back in Johor to operate a restaurant with the support of lean team and with, (I observe) very much, a hands-on attitude. For starters, it must be Chilli Crab and Mantao buns because Chef Dass tells me that he prepares the Chilli Crab dip using his mother’s (Indian style!) Sardine Curry recipe. Someone picks the Mediterranean Salad topped with grilled prawns, watermelon and feta cheese, drizzled with their own recipe Lemongrass Vinaigrette. Then there are two burgers to share: Classic American Cheese Burger and Chinese Ham Burger that each comes with potato fries – popular bites for the youngsters. The barbecued Pork Ribs come highly recommended and there are six meaty ribs to split among us. By the time the bones are extracted, there is plenty of meat to enjoy among us! We agree that Char Siew Salmon which comes with a side of potato mash, and Beef Stroganoff on a bed of mash, were items just right for mum. We will of course, let mum have her first pick and we will share the rest, making sure there are no leftovers! The beef is both tasty and tender and Chef Dass’s introduction of that side dish of salsa, is indeed a refreshing contrast to the dense flavour of the Beef Stroganoff. After reading the ingredients for toppings on the Super Supreme pizza, we feel that it is a must-try item. There’s pepperoni, buck worst sausage, beef, capsicum greens, bacon, chicken ham, button mushroom, onions and black olives, with three types of cheese! The pizza comes freshly-made on thin crust pastry and it’s good that we can sink our teeth into plenty of ingredients with every bite. Then it’s time for dessert. As Chef Dass tells us about Dine’s own-recipe gelato, I cannot resist the call of the Salted Caramel gelato and succumb to an order of Chocolate Walnut Brownie topped with a scoop of Salted Caramel gelato. Then for the two mothers – mum and our sister-in-law – Chef Dass presents them with a serving of Salted Caramel Tiramisu, made in his own recipe and with his best compliments! Pizza Super Supreme where we can taste ingredients in every bite! This is indeed a young man after every woman/mum’s heart. Dine Restaurant is at N0. 14, Lower Ground Little Red Cube, Persiaran Puteri Harbour, Puteri Harbour, 79000 Iskandar Puteri, Johor. It serves a NON-HALAL menu daily from 12pm to 11.30pm from Monday to Thursday, and till late on Friday, Saturday and Sunday. For reservations, Tel: +607 – 553 9964. When cousin Bernice came back to visit her parents in Kuala Lumpur she planned it in secret and successfully sprung a surprise on them. We were back at Loh Ban Thye department store again! Later when she told me that she was coming to see us in Johor Baru, I reminded her not to try to spring any surprises lest she be surprised if mum and I were not in! She took my advice and even sought my help to make their hotel reservations here. Then I was told to ‘block off those dates’ so that we could spend some time together. I was more than ready to show her our warm Johor hospitality because Bernice was an excellent host when my siblings and I stayed with her family in Wimbledon during our stopover in the UK last year. Besides coming to be with us again, Bernice also had a list of local food that she deeply desired to taste again. her successful shopping trip at Ban Thye! Having stayed abroad for long periods, I can relate to her longing for that familiar taste of comfort food which she grew up with in JB, especially now that she lives abroad. So from the moment they – Bernice and her parents, along with Aunty Sylvia – arrived in JB, they were off to an eating marathon! Top of her must-eat list is a Johor delicacy, kway chap – A Teochew dish of flat rice noodles in dark herbal soup eaten with a variety of side dishes including braised eggs, braised pork and innards. Then there are snacks like JB-style rojak and Air Batu Campur (ABC) drizzled in melted cocoa from our regular stall and pisang goreng or fried bananas enjoyed with a spicy dark sauce dip. Two types of noodles in her choice were traditional Teochew mee-pok-tah or dry-tossed flat noodles along with lobak, a variety of ngoh-hiang or fried minced-yam-meat rolls and pink-coloured fish balls; the other was Cantonese kon-lo-mee or dry-tossed noodles prepared using handmade noodles unique to Mee Ho Seng Kee. I’m not surprised at her request to savour these food items because they are typically Johor and nothing served elsewhere, ever came close to the original here. Handmade Ho Seng Kee noodles in the "original" toss recipe! One is to shop for cotton singlets – made with holey fabric – which their grandmother first bought from JB’s own brand department store, Loh Ban Thye, that Bernice’s two sons liked to wear. On this trip, Bernice wanted to buy more singlets in larger sizes as her boys are growing quite rapidly. 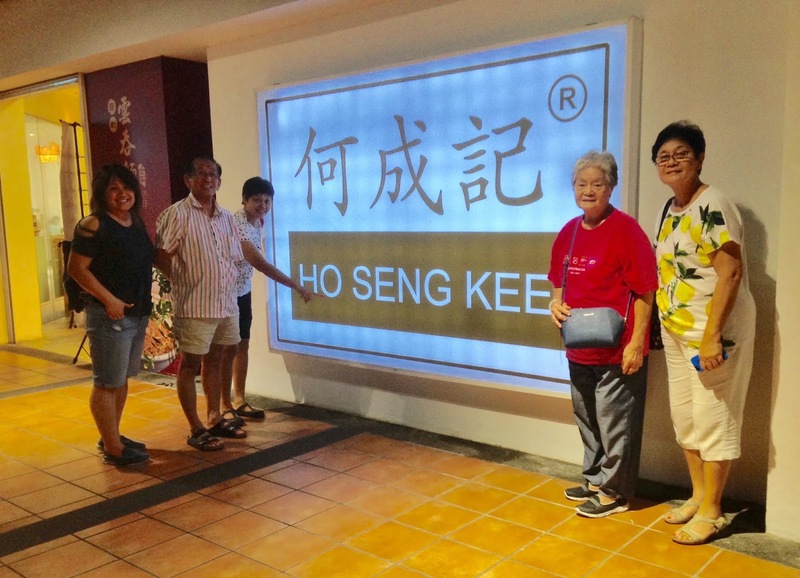 The other is to explore JB’s heritage quarter and drop by to visit the Chiew family who still runs the Shanghai Dhoby or traditional Chinese laundry at Jalan Tan Hiok Nee. 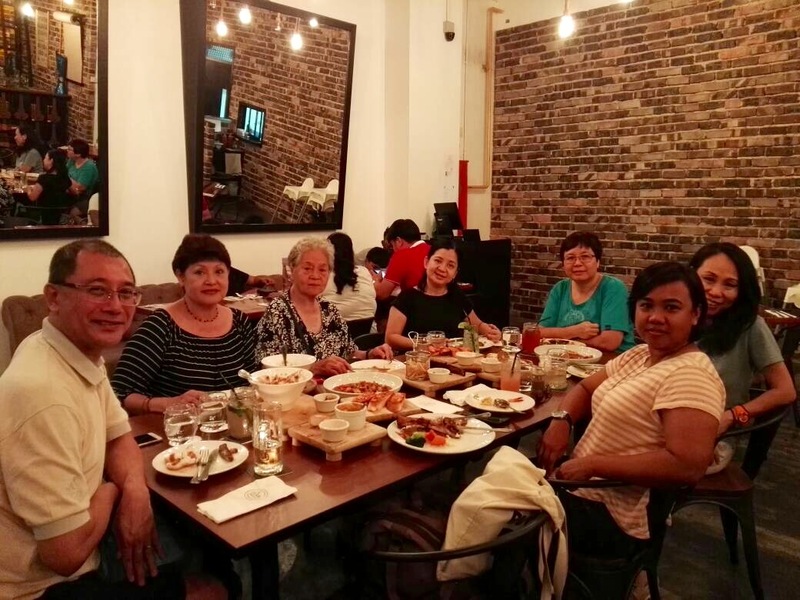 In 2015, while I was working on my story about the Chiew family and their laundry, Bernice and her former classmate, Karen Chiew, had met for their lunar new year reunion dinner in London, where they both live. They were friends since Standard Two when they went to school together in Kluang, Johor. In the course of their conversation, Bernice discovered that Karen’s grandfather used to run the Shanghai Dhoby shop in JB! When Bernice shared her exciting discovery with me, I was happy to tell her that I met the Chiew family members in JB for my story about their family’s laundry business. In fact, this Laundry Legacy story is featured under the Portraits section of my book, My Johor Stories: True Tales, Real People, Rich Heritage. On that warm but wet afternoon, our first food stop must be for rojak and ice-kacang at our regular stall in the Taman Pelangi food court. Bernice’s strategy was to enjoy the rojak and grilled stuffed tofu first and then order the iced drinks later. In our tropical heat, the ice would have melted quite quickly so it was best to order them later and ensure that the ice remained as ice! The wet weather certainly did nothing to deter our plans to get pisang goreng and other fried items as takeaways to savour with spicy dark sauce dip, in the typically Johor way. Later it was dinner at Mee Ho Seng Kee, a traditional noodle brand now opened as a café on Level Six of Johor Baru City Square. While this café offers a menu of add-on items along with their signature dry-tossed noodles, for die-hard fans like us, only the satisfying taste of the “original” will do. For late night supper, it was kway chap from a popular outlet at Taman Pelangi. The next morning I took our visitors on a heritage walk that started at Loh Ban Thye department store, situated at the corner of Jalan Trus and Jalan Ungku Puan. Bernice managed to find those cotton singlets favoured by her boys! At Jalan Trus, we made a brief stopover at Sin Keng Wah Kedai Tilam to say “Hello!” to the proprietors, Ah Soon and his son who are still making cotton-stuffed mattresses, pillows and bolsters, the traditional way. It was good to revisit this familiar street where we are acquainted with many of the local traditional, family-run businesses. While it was lovely to see how some old buildings and businesses are carefully preserved, it was also sad to see some buildings left in a sad state of disrepair. We could not help stopping to reminisce, admire and take some shots before heading to Jalan Tan Hiok Nee for Bernice’s choice of chopped lobak items and mee-pok-tah. We aimed to avoid the lunch crowd but the tiny shop was still crowded with a mid-morning brunch group who (just like us!) probably wanted to beat the lunch crowd! In the sweltering heat and humidity, and with perspiration dripping, we enjoyed yet another noodle meal with great satisfaction. From one end of Jalan Tan Hiok Nee, we walked to its opposite end while browsing around the shops, and watched the long queue lined up in front of the old bakery before dropping in at the Shanghai Dhoby, laundry. Finally, while my aunts and mum sat down for a coffee at a nearby café, I took a brisk walk via Jalan Duke to collect my car from the adjacent carpark and picked them up. The hotel had graciously extended their check-out time so I dropped the visitors back on time to check-out and leave comfortably for the next leg of their visit. That night I received a photo and message from Bernice showing off their Hainanese beef noodles meal in Kluang – a stopover for familiar food in the town where they used to live – before heading back to Kuala Lumpur. Bernice [Centre] and her dad, Uncle Steven [Left] visiting JB's heritage quarter. It was indeed a veritable food trail, not just for Bernice to enjoy but for us too. Thanks for your visit, Ber. You were our excuse for revisiting our favourite local specialties! Let’s plan for the next cousins meet-up (and makan) soon! Lego Star Wars Days are here again!